Rooms from $125.00 per night. Description This College Park, Georgia hotel has an indoor pool, free internet access and non-smoking guest rooms. 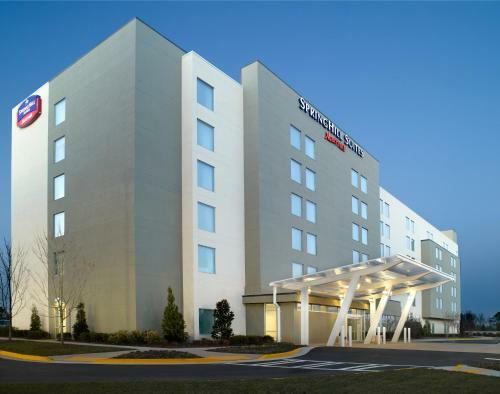 A free airport shuttle a hearty free buffet breakfast an on-site restaurant and an indoor pool are all offered at the Springhill Suites by Marriott Atlanta Airport Gateway. This six-floor 147-room non-smoking property offers innovative seating throughout the public areas where you can hold impromptu meetings and enjoy free use of the hotel-wide free Wi-Fi. Rooms have separate living and sleeping areas ergonomic desk chairs flat-panel TVs with cable iPod docking stations and microwaves. The indoor pool and workout room (with both machines and free weights) offer options for relaxing at the end of the day. This property also has a massive ballroom that can accommodate large meetings and weddings. Other amenities include a coffee shop a coin laundry and valet dry cleaning. The Springhill Suites is off I-85 in College Park right next to the Georgia International Convention Center. Hartsfield-Jackson International Airport is a two-mile drive GÇö or to make things easier you can take the SkyTrain directly from the hotel to the airport and connect via MARTA to the rest of Atlanta. The hotel is nine miles from Turner Field 10 miles from Zoo Atlanta 10 miles from Underground Atlanta 14 miles from Six Flags Over Georgia and 28 miles from Stone Mountain Park. 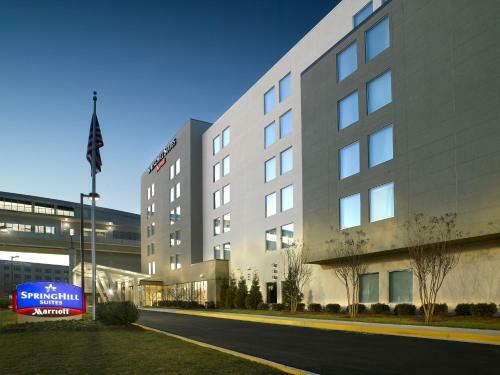 Add Springhill Suites By Marriott Atlanta Airport Gateway to your free online travel itinerary.